When you dig further into the relationship between partners and vendors, there seems to be an infinite number of ways the relationship can sour. In fact, CompTIA reported in their annual State of the Channel study that 60% of partners report that channel conflict is on the rise in the last few years, with 21% saying it rose significantly. Looking further into the research, the most common reason partners leave a vendor include high cost, low margins, constantly changing requirements/benefits, insufficient support and lack of marketing support. An astonishing 80% of partner firms said conflict affected their business negatively in the past few years. There are many reasons for this increased conflict. The shifting customer landscape has vendors shifting go-to-market strategies from indirect to direct sales as well as increasing their services arm. Other reasons fall into trust and transparency issues - including not honoring rules of engagement, deal registration policies, sales engagement and territory violations. Being completely honest with channel partners is the most important part of building a lasting, trusting partnership. One lapse can cause irreparable damage and can halt a promising alliance in its tracks. Partners are a resilient bunch, and while it may be painful in the short-term, bad news delivered straight and in a timely fashion will usually be forgiven. Trust is built over time through consistency and honesty. With so many moving parts inside a vendor organization and the ever-changing business dynamics, it is hard for partners to know what is happening. The best policy is to have open dialogue and share more than before. Partners run businesses too and will appreciate hearing the opportunities as well as the challenges. This can have a positive effect where partners may actually help with the challenges or suggest how other vendors solved them. One of the most common complaints a channel has is change. Not change for the better, but change for the sake of change. Larger vendors are guilty of changing up their rep coverage on a yearly basis and the partners are forced to re-educate new people constantly. This goes for programs too - when the average partner has over 10 vendors, keeping up with the changes can be a dizzying experience. Most vendors think that they over-communicate. However, when they bring together their partner advisory council, a different story is heard. There are roughly 30 communication vehicles that vendors use today including email, newsletters, phone calls, field visits, webinars, tradeshows, social platforms, etc. In many cases, these vehicles aren't owned exclusively by the channel organization and partners are bombarded by every division and perhaps every well-intentioned product manager at the vendor. Pre-sales, post-sales and 24/7 technical support are now table stakes for vendors. Visibility also extends to the marketplace - partners shouldn't have to bear the brunt of marketing, educating and selling the vendor's products. Communities are everywhere, and vendors must participate in the associations, peer groups, tradeshows and industry media that drive awareness. As noted above, conflict continues to be a challenge in the channel. A published rules of engagement that is supported by upper management at the vendor (as well as escalation and mediation policies) are critical. Not every situation is unique, and vendors need to have consistent and predictable responses to conflict situations as they arise. The results could be positive or negative for the partner - but as long as they are fair and consistent, then cooler heads will prevail. Vendors tend to work on a pendulum when it comes to recruitment. Every other year, a new VP will come in and put recruitment efforts in overdrive without a proper go-to-market strategy and capacity planning exercise. Current partners will feel the encroachment and suffer further competition in their geographies. At least till the following year, a temporary reprieve when focus will go back to nurturing and development. Partners need their systems and business processes to integrate better with their vendors. Giving partners a dozen passwords for every different part of the program doesn't make sense and will cause abandonment of the behaviors originally sought. Careful thought should be put into the channel software stack and to make sure the labor doesn't get passed to partners. This may seem like common sense, but partners would tell a different story. Building a channel program isn't easy - especially with the permutations and combinations of industries, geographies, business models, lines of business and partner types are included. Persona based incentives, education and motivation techniques are needed by very rarely delivered - and it causes unnecessary friction. It always amazes me to see vendors sweep in a new management team and want to fire the bottom 10% of their partners without studying why they are the bottom 10%. People have long memories and the industry is smaller than you would think. Yes, there are 160,000 partners in North America (which seems like a lot) but when you look at merger & acquisition statistics as well as people changing jobs, those faces can come back to hurt you later. The average channel chief wears about 10 hats and drives 72 functional areas of channel management, sales and marketing. Lost in this complexity are the core reasons partners don't perform and sometimes leave. 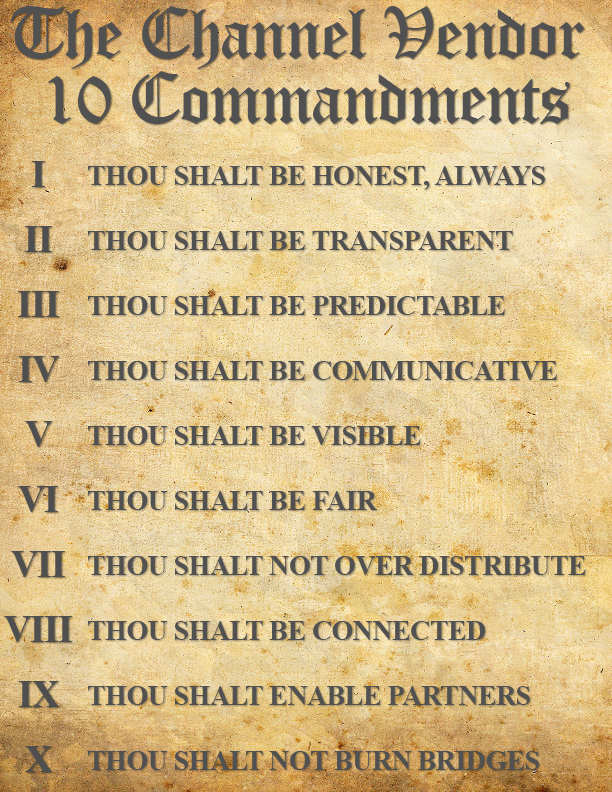 More often than not, following these commandments will have a bigger impact than forever tweaking 72 parts of the channel program. Try putting this on the agenda of your next offsite planning session.